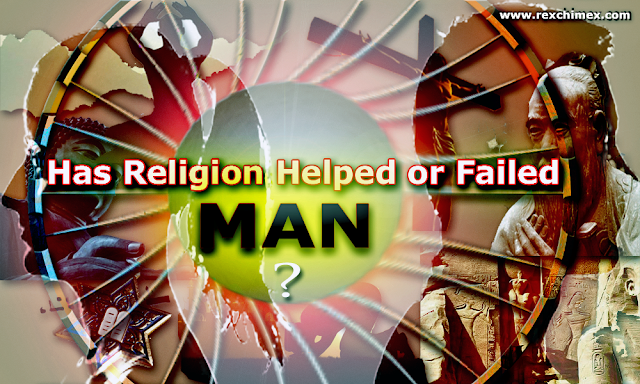 Has Religion Helped or Failed Man? Religion and man appears to be two inseparable entities. Man could not understand the in-depth reason nor could he explain vividly the self-asked questions such as, “Why I am on earth, and who designed it?” “Where do I go, when I die, will I reincarnate?” “Who keeps me alive, and what is his purpose for me?” He sees the plants and he examines its leaves and body, he saw a huge expanse of land filled with water and he called it an ocean, sea, lake, or river. He was eager to differentiate things, having been filled with vigor and engulfed with insatiable curiosity and enthusiasm to discover the hidden facts of life. Man soon became super-convinced that a super being or a force mightier than him was in existence, controlling the earth and universe. Thus the emergence of religion, which seeks to provide answers to the unanswered questions of man. He persevered to investigate further, and he discovered that the earth rotates in its axis. No wonder the day and night, he concluded. He took notice of the sun and moon, who created them? He got no convincing answer; he formulated his theories and yet was not satisfied. He was then tempted to worship the sun, and yet he did worship the sun, of which lead to the emergence of solar deities such as, Ra the Chief god and sun god of ancient Egypt, Amadioha of the Igbos, the Surya of the Hindu, and the Amaterasu of the Japanese etc. He never ignored the moon too, for he was fascinated by its brilliance at night. He delved into moon worship, which led to the emergence of lunar deities such as Ala of the Igbos, Selene of the Greeks, Khonsu of the Ancient Egypt, Chandra of the Hindu, Diana of the Romans. The crescent moon became associated with a religion such as Islam, and men such as Hugo Winckler an archeologist and Robert Morey an American evangelist concluded that Allah was a moon god. The cross, which is a symbol of worship in Christianity, was also alleged to have originated from pagan worship, before the actual coming of Christianity. If the cross is a Christian symbol, it cannot be correctly said that, its origin was within Christianity, for in one form or another, it was a sacred symbol, long before the Christian era and among many non-Christian people. So many scholars argued, referring to the Tau cross (†) used as a symbol of the Babylonian sun god Tammuz (Tammuz was also mention in the Bible when women wept for him – Ezekiel 8:14), the temple of the cross in Palenque – Mexico etc. A lot have to be said but religion appears to be a commixture of the old and new. The concept Religion is widened, if we see it as the faithfulness of man to a given principle, which he believes-in. The broadness of religion is narrowed, if we see it as the belief in and the worship of a supernatural being (God and gods) with super controlling powers. The super beings with supernatural powers have proven in mystical ways, to have the answers to the questions that have made man restless through the Dark Age to the Digital Age. 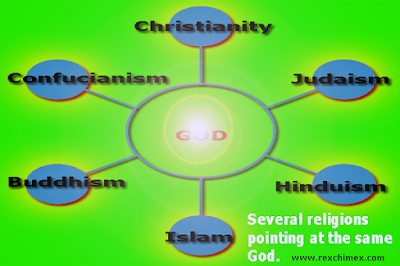 The major religions in the world encompass Christianity, Judaism, Islam, Mormonism, Hinduism, Buddhism, Confucianism, Taoism etc. In each of these religions, man gave the supernatural being(s) name(s) or either followed the footsteps and teachings of men believed to be wise and principled, for example, In Christianity we have God (Jesus Christ, Holy spirit); In Islam we have Allah. In Judaism, we have YHWH (Adonai), In Hinduism, we have several gods and goddess like Brahma, Vishnu, Shiva, Ganapati, Krishna, In Buddhism we have the Buddha, In Taoism we have the Tao, and the same applies to several other indigenous religions. Man began to believe in God and gods; seeking for power and protection at all cost, the existence of the spiritual world was not in doubt and could not be swept under the carpet. Every religion claims that they have the true God or gods; they say that others outside their religion are misled. Talking about “The True God” in the first place, tells one that some religion may not really be getting it right. For clarity sake, every religion hopefully seeks the same God, but in different ways, because every man has different questions that needs different answers. God can be seen as the hub (the center of all) of a wheel and all the religions in the world can be seen as the spokes of the wheel. Undoubtedly, God has spoken to man, but man has interpreted it in so many ways, leading to the fragmentation and sudden irruption of so many religions. The quest of man never ended, he went further to receive messages from the super being(s) and listen to the messengers of the super being(s). Within a short duration, so many forms of religion came into existence, even today and at this moment; more are still regrouping and springing up, because the quest of man for the perfect religion with the perfect route to the true God or gods appears insatiable. Can this religion lead one to the creator of the earth? He keeps asking until his doubts are cleared by the doctrines of the religion he finally believes-in. How true is it that every other religion is false and Hinduism is true? How true is it that every other religion is false and Islam is true? How true is it that every other religion is false and Christianity is true? The same applies to every other religion. How true is their faith and doctrine of worship? Are they the ones with the true God? Ask yourself this question - if you were a Muslim woman and you have believed all your life that Islam is the only way for you to make heaven or else rot in hell. Then a Christian man comes to marry you, would you not ask yourself, would this man allow me to practice my religion in marriage? If I accept to marry him, would his religion, lead me to heaven? These questions become necessary, because a mind embedded with a strict religious belief, would upheld what its stands for at all times unless proven otherwise. We can go on and on arguing and advocating whose religion has the true God, but at the end of the day, we retire back to our respective religions or rather become irreligious. This is because God is God, and people seek him in so many ways with clear understanding and clear interpretation or with misunderstanding and misinterpretation. He who is protected or deceived becomes a follower. Man was gullible to sorcery, magic, and miracles; such events leave him in awe and astonishment. He joined mostly any religion that answers his perturbing questions, believes every doctrine attached to the religion, and then he turns around to preach against and sputter degrading statements about every other religion existing on earth. Some religions become predators, trying to capture a weaker religion and destroy their beliefs. The weaker religions lose members who join the super religion, having believed that they have the true God with them. From time immemorial, every religion that exists on earth strives to see about the welfare of its members first (preferential treatment), thereby creating division among men. For example, the Christians believe that only they will go to heaven and every other person outside Christianity will inherit hell. Similar and contradicting beliefs exist in other religions, some even believe that heaven, and hell neither exists. Religion then makes man to be self-centered and unaccommodating to the extent of him judging men of other religion as foolish, infidels, impure, the ungodly, enemies, or beasts. Most religion claim, according to their doctrine, mode and book of worship that they advocate for peace, “Now, tell me why there is so many religion and yet there is so little love? Will I ever get to know the truth of this?” (Asa a Nigerian musician asks in her song titled ‘Questions’). If religion strives to teach man to be a loving and peaceful being, why is the world still in endless chaos? Wickedness and mayhem-unleashed day by day, most times evil is committed in the name of the same religion of which he strives to uphold and defend. Religious crisis and intolerance tearing the society apart. This lead to the emergence of the atheists, men who believe in no deity or divine being. Most of them were scientists and they sought to disapprove the existence of God, they totally believed that religion has refused the advancement of man and has instead persistently dragged man back to the Stone Age (primitive lifestyle), by the gross adherence of man to restrictive doctrines of old religions. Magic and miracles rendered scientific findings and experiments invalid, and they became infuriated at the mention of spirituality, because it was spontaneous in nature, it just happens! Miracles just happen every day. Nevertheless, whatever a man believes-in, is his religion. Whether an atheist or a theist they both live on certain principles which they follow religiously and that is his religion. A man without principles is doomed. Even if religion never existed, and man was to operate without incorporating religion into his ways of life. Man is still expected to live up to expectation, having been endowed with the free will, rationality, and moral compass (conscience) to direct him every seconds on how to do what’s right and proper, he is expected to move away from evil and move towards good. However, due to the failure of man to live up to expectation, by the constant perpetration of evil and atrocities, various religion came up to try to keep him in order. Man needed rules and regulations, laws and constitutions, The Bible, The Koran, The Vedas, The Tripiṭaka, and the Dhammapada, The Torah, The Analects of Confucius, The Tao Te Ching etc. to live in harmony and peace, but yet evil and atrocities could not be eradicated from the surface of the earth. What else does man need? So now, the pertinent question begging for a lucid answer is; “Has religion helped or failed man?” to answer this question, one has to reflect at the benefits of religion to man, the problems religion created for man, and what man has done as a beneficiary of religion. Religion as a set of belief has tried to curtail or exacerbate man’s excesses. It has answered various questions of man and has created the room for more confusion, because religion is a tool at the complete disposal of man. Man has orchestrated religion to suit himself with respect to the trends and advancement of the modern world. Even currently, some religions have been modified to extort money from members without their consciousness, because of their gullibility and blindness to the actual foundation and the origin of the place of worship, where they seek God. Religion has helped man in some areas of life by teaching him to be God-fearing, loving (especially to people within the same religion), caring, and compassionate for a better world. However, it has failed man by turning him to become intolerable of other religion, creating division among men, thereby destroying all that it has built. Religion contradicts itself and man stands at the center to enjoy and withstand the worst of its constructive and devastative effects. People no longer work hard to achieve success because they constantly seek the intervention of superpowers and blame every problem on witches and wizards, and so they prefer fasting and praying while the problem clearly stands still, untouched, and formidable. If man is not happy with his life today, he should not blame religion. In addition, if he were happy with his life today, religion would not take the credit either. Man should not blame nor praise religion for his woes and blessings. He takes the credit and reserves the right to ascribe the glory to God or gods, if he is wise enough. Instead of praising or cursing religion, he should keep examining his life with his moral compass (conscience) and belief (religion), detecting where he is getting it right or wrong for a good past, a better present, and the best future. If one keeps being scared of life and then decides to hide under the cloak of religion to deceive the world, then he or she is yet to discover him or herself. Religion has helped man, and failed him in some aspects of life, but man as a beneficiary of religion has consistently failed himself, because an unexamined life is not worth living at all.